YOUR NEW BEST FRIEND: A QUICK PAN SAUCE | Jane Lear. Writing on Food and Travel. In the kitchen, as in life, a little finesse goes a long way. And when you are simultaneously in front of the stove and behind the eight-ball, nothing proves my point faster than a pan sauce. Unlike voluptuous egg- or butter-based sauces such as hollandaise or beurre blanc, a pan sauce is an extension of whatever you happen to be cooking. The technique involved—called deglazing—soon seems as natural as breathing. I’d made one particular pan sauce for years before I had any idea what it was. The recipe was courtesy of Eleanor Gustafson, a colleague at Antiques magazine and the harried, hawk-eyed mother of four. During the editorial staff’s communal lunches, we diligently entered sweepstakes contests, debated the finer plot points of Dynasty, compared notes on what dealers were doing jail time where and for how long, and exchanged recipes. I’ll spare you the tutorial that followed. All you need to know is when you cook meat, any meat, over moderately high heat, you are going to end up with unprepossessing brown bits stuck to the bottom of the pan. Beauty, as they say, is in the eye of the beholder: What you are looking at are spackled-on meat juices, a.k.a bullets of flavor. And when you dissolve them in some liquid—not too much, or you’ll dilute instead of concentrate that lovely essence—the end result is even more complex-tasting that the caramelization you get when you brown something high in sugar. An added bonus is that all that dissolving basically cleans the pan for you. The butter-Worcestershire-lemon combination works like a dream, but it’s easy enough to go in another direction. For fish fillets, you might think about using soy sauce or tamari instead Worcestershire. And I’m always a sucker for the old-school combinations you’ll find in France—Madeira and sautéed mushrooms with a thin steak, or the mustard-cream pairing you’ll find below spooned over pan-roasted chicken. Digression: For the record, I’m a big fan of chicken parts. I know that buying a whole chicken and cutting it up at home is more economical, but I often buy parts so I can get as much moist, flavorful dark meat as I want. Compared to breast meat—which is much more expensive per pound—thighs are a terrific bargain. Adding mustard to almost anything is a classic shortcut to body and brightness; a little cream brings everything together. It’s pretty miraculous, when you think about it. And it also instantly transports you to France, especially on a cool, rainy spring evening that smells faintly of lilacs. Preheat the oven to 450ºF. Heat the oil in a large ovenproof skillet* over medium-high heat until shimmery. Add the chicken, skin side down, and brown it well before turning it over. (Patience, here: If it doesn’t release easily, let it sear a minute longer.) Brown the chicken on the other side, then turn it skin side up again and pop the skillet into the oven for about 20 minutes, or until the chicken is done. Transfer the chicken to a plate, then add the wine and broth to the skillet. If you wanted to toss in a tablespoon of sliced shallots at this point, I wouldn’t say no, but it’s perfectly fine without. Bring the liquid to a boil and boil away for a few minutes. Reduce the liquid by about half, all the while scraping and stirring the brown bits with a wooden spatula (one of the most inexpensive, useful kitchen tools you’ll ever own) to help them dissolve. Add the heavy cream and boil a minute or so longer, just until the sauce thickens to a nice spoonable consistency. Now, I was taught to strain the sauce at this point, but, unless people are coming over for dinner, those days are gone. I simply whisk in the mustard, then taste before I season with salt and pepper. Once you have put the chicken on warmed plates (perhaps with parsley potatoes) and spooned some sauce over the crisp skin, you will realize that you have made an extraordinary dinner in almost no time. 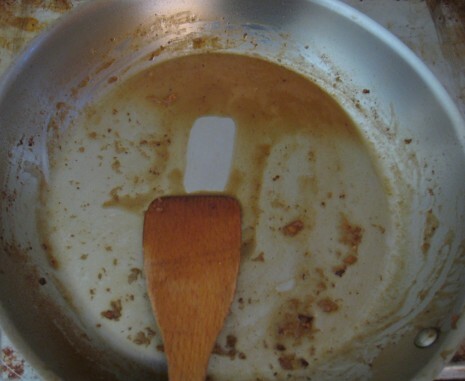 * For making a pan sauce, I much prefer a traditional skillet to one that is nonstick. You won’t get as many brown bits in a nonstick skillet, and the dark coating makes them almost impossible to see. My All-Clad 12-inch Fry Pan has been my go-to skillet for about 15 years now, and it’s still going strong. It heats up relatively quickly and spreads a steady heat—key to putting a great sear on meat. A low, sloped side makes for a generous cooking surface and it also allows for easy whisking of a pan sauce. If you don’t have this type of skillet, all is not lost; a shallow braising dish is another great option. Can you tell I just found your blog? That is actually my 6 yr-olds favorite dish, which, after telling her teacher’s at daycare about it for 3 days (the best dish in the whole world! ), I finally I had to make it last night. This time, I let her help, just so she could see how simple it is to make something so delicious, with so few ingredients. I know she’s only 6, but I’m hoping she’ll be cooking for me soon! That is just the NICEST story….You made my day! !